Describe your current work/ practice in one sentence. In each piece, I want to represent a moment in the interplay between ideas of value – or what we personally consider valuable, meaningful – and how these ideas connect to intangible aspects of memory or heritage. 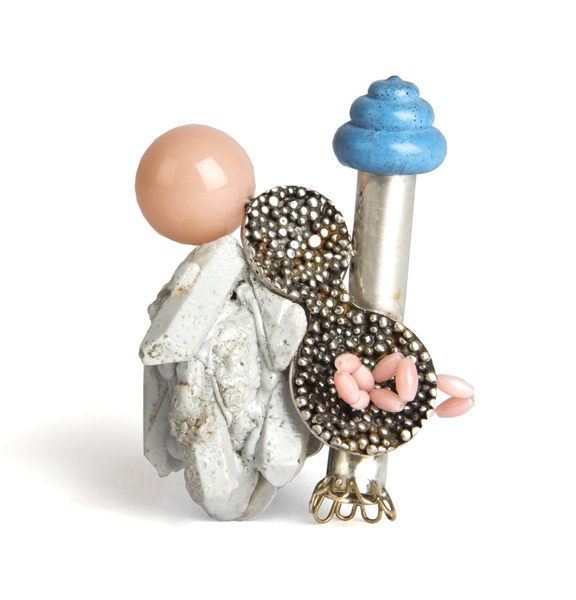 As an art jeweller, I often take inspiration from the everyday and found objects that I incorporate into my work. But how I articulate these materials in a finished piece is also influenced by my life experiences, as well as the dialogue that I want the piece itself to inspire with its wearers and viewers. My art practice has grown increasingly reflective of my life experiences throughout my career. When I bring my life experiences into my work, I draw on and find inspiration in the places I have been, the people I have met, my family’s history, and also my identity as a Maritime artist. For instance, in my solo show in Ottawa’s L.A. Pai Gallery in August 2016, all of the pieces were in conversation with my family’s background in the Maritimes. In my current work for my Candy-Coated Recollection series, I bring some of the feelings and memories of my childhood into conversation with precious metals, gemstones, as well as non-traditional materials and found objects. One of the things that I love about art jewellery, and something has always inspired me when working in this medium, is how jewellery objects are often powerful symbols that carry meaning beyond the object itself. As adornment, the piece directs the gaze to the relationship the piece has with the wearer, as an extension of the wearer’s personality and presence. To viewers, a piece may pose questions, provoke emotion, or invite a conversation and engagement with the wearer. Ultimately, the jewellery I choose to make is inspired by the idea of ‘fun’ and ‘dress up’ playing with scale, and colour. What are other things you do besides your jewellery practice? Professionally, I have my Journeyman Machinist Certificate so I am able to work and teach in Canada’s industrial sector. Artistically, outside of the jewellery scope, I love to sew, paint, and draw. What is your favourite piece that you've made and why? Jewellery making plays a therapeutic role in my life. I generally make one of kind works, so every piece holds special significance to me marking the time it was created, and each has its own merit within a specific series. With that said, my favourite piece would probably be a ring I am currently in the midst of working on. It is the only piece I have ever made for myself to keep. It is an adaptation of my grandfather’s signet ring, and gold left to me by my grandmother. It depicts a life preserver landing on a rocky shoreline at sunset. To me, this ring tells a story of love, family, loss, as well as the memory of these two special people in my life. The individuality found in Canada’s art jewellery scene stands alone. 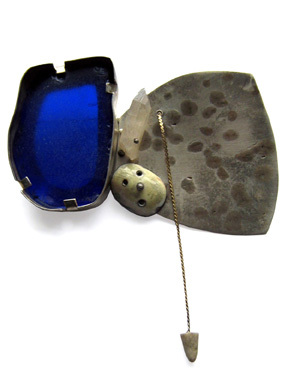 Like in my own practice, a lot of jewellery artists reference their identity through their art – which naturally changes and shifts over time and place. The choices an artist makes, in the materials they explore, the style or composition of their work captures their personality. There’s no one Canadian art jewellery style. Even though we often work in similar media or work similar narratives into our craft, no two artists will come out with identical pieces. I am excited to say that I am currently acting Exhibition Coordinator for Co–Adorn, a new Maritime-based Jewellery Society (see our website at www.co-adorn.com). We are looking forward to our first annual exhibition at Studio 21 Fine Art Gallery in Halifax, Nova Scotia. Our exhibition is titled Conversation Starter, and we expect nationwide applications until April 19th. The show will run from June 8th to July 5th and we anticipate that it will help bring long-overdue recognition to the thriving Maritime art jewellery scene. Working with this group of spectacular artists is a wonderful opportunity for me, and I hope to see this collective grow into a strong resource and advocate for our craft. I am proud to be part of this innovative group of artists who are finally getting this conversation started.